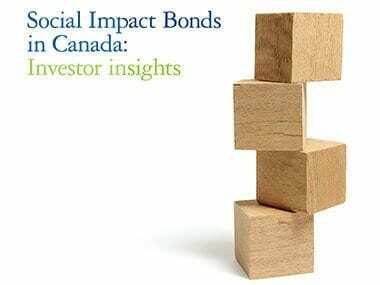 The marketplace for social impact bonds (SIBs) is continuing to develop. Service providers are making progress in advancing their SIB business cases for their most promising interventions. Governments are taking steps in the procurement process for outcome contracts, exemplified by the Ontario Ministry of Economic Development, Trade and Employment’s recent call for SIB concepts and proposals. Now, as the results of our market consultations demonstrate, investors are also signalling their interest in the development of a SIB market in Canada. SIBs have emerged as instruments that can innovatively bring together investors, social-service providers and governments. What makes SIBs unique is that this convergence of stakeholders is made possible through a pay-for-performance contract focused on achieving specific social outcomes. Understanding the needs, preferences and perspectives of these potential stakeholders is an indispensible first step in bringing together an effective partnership. This principle shines through in our report’s focus on understanding the current perspectives of investors and what that means for the development of the Canadian SIB marketplace. To realize this goal, we held consultations with investors based in Canada. The consultations enhanced the engagement of many investors in SIBs and the results offer unique insights into investors’ interests and their potential involvement. We found that investors spoke passionately and thoughtfully about harnessing all possible channels to overcome systemic barriers to tough social issues. Overall, our findings from our investor consultation are positive and encouraging, and are summarized as follows. Given the right deal, investors are willing and able to fund a SIB. A vast majority of respondents would be interested in considering SIB investments. Investors are willing to consider a broad range of social issues and jurisdictions. Housing and homelessness, youth issues (notably unemployment and skills training), aboriginal-focused issues, health and education all surfaced as issue areas of potential. The investor market has identified challenges to the successful implementation of any SIB deal in Canada, the most significant of which are: collaborating with government, risk/perception of risk, liquidity and stakeholder capacity. Investors would prefer to co-invest as part of a consortium in order to share capital commitments, due diligence, governance and learning, as well as to allow for risk reduction. Capital de-risking, such as guarantees, is preferred by investors to minimize exposure to execution risk. Investors would prefer to conduct a SIB deal through an intermediary. It is believed that a SIB market will develop in Canada if governments implement measures to remove barriers, and explore and test impact-investment models. While our impressions of our investor consultation are generally positive, it is important to be mindful that expressing interest is different than making an investment commitment. Migrating investors from the interest state to the commitment state, with the right business case, will continue to require considerable education and capacity-building efforts. The barriers expressed by investors must also be addressed, including the restrictions on foundations to invest in limited partnerships and limitations on the enterprising activities of non-profit organizations. Finally, government commitment to launching and delivering on SIB procurement processes in a way that appeals to investors will be critical. We hope that all SIB stakeholders, including governments and service providers, will benefit from this report, a first-of-its-kind portrayal of early Canadian impact-investor viewpoints. MaRS Centre for Impact Investing would also like to take this opportunity to introduce Samer Abughannam, who is a dedicated SIB practitioner and our contact point for SIB investor engagement activities. Please feel free to reach out to him with your questions, comments or inquiries.